How to Check WeChat Deleted Messages? Sometimes, users of WeChat (The popular messaging app) ,may want to look through messages that have already been deleted on their iPhone. This may be due to the accidental deletion of important or crucial messages. It may also be out of a desire to identify and permanently expunge messages of a very private nature as a result of privacy concerns, since deleted messages are potentially recoverable given the right means. Whatever the reason, there are ways through which we can check deleted WeChat messages iPhone. There are several ways one could get to view iPhone/iPad WeChat messages that have been deleted. This will be important to keep from permanently deleting files that may potentially need to be recovered in the future. iMyFone Umate Pro is an iPhone WeChat eraser which can permanently erase private WeChat messages from iPhone. Step 1: Download the software to your computer and open the software by launching it. Step 2: Connect your iPhone to the computer using a USB cable. Step 3: Click on the “Erase Deleted Files” tab in the menu on the left side of the screen and a new window will open on the software interface. Step 4: Click the scan button in the central pane of the new window, and wait a while till a list of all the files to be permanently deleted appears. Step 5: It will now be possible to look through the list of WeChat deleted files, and choose the files which should be permanently expunged. There are some privacy concerns with WeChat, which may necessitate permanent erasure of data. WeChat has been associated with the XcodeGhost malware. This malware gives a third party access to information about the usage of the app, and it may permit remote control and interference with the application and with its various functions. WeChat can actually transmit the user’s data information and modes of usage for surveillance and censorship purposes. WeChat also has a location reporting feature, which could potentially compromise the safety of users and their data. If private data on your WeChat app is merely deleted, the data and information can still be recovered by using appropriate advanced recovery methods. This will cause a breach in one’s privacy, as sensitive and confidential information that has been deleted may still be accessed by others. Erase private data: This ensures that your private WeChat data is thoroughly erased from the phone. It will be impossible to recover it, even with advanced data recovery methods. You can even use Umate Pro to erase broken iPhone. Erase deleted WeChat data: With Umate Pro, it is possible to erase deleted WeChat data. When this is done, the selected file is thoroughly erased from the phone, and the data cannot be recovered. Erase WeChat private fragments: Fragments of files and posts may be left behind by WeChat. Their retention can also cause a privacy breach as they can be accessed by appropriate methods. Umate pro can thoroughly erase all private fragments left behind by WeChat. •	Umate pro can be used to transfer photo/videos from the iPhone to the computer. 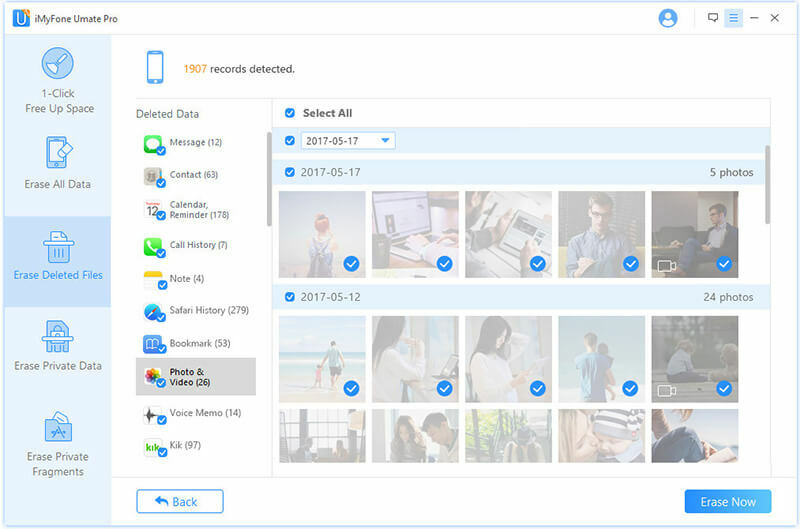 •	Umate pro can be used to remove useless data and files which are not needed, from the iphone. Such files include caches, cookies, corrupted files, temporary files etc. 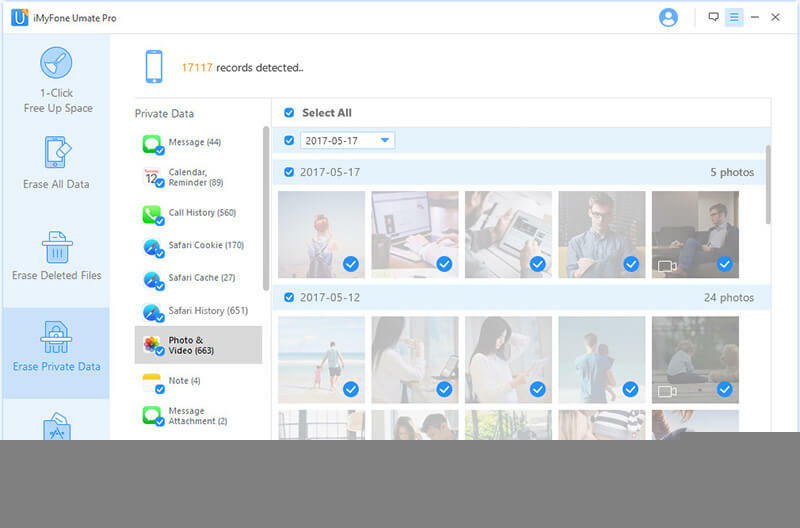 •	Umate pro can also be used to free memory space on the iPhone by compressing photos or mass deleting iPhone photos/large files and Apps.